Grand Boulevard, located on the South Side of Chicago, Illinois, is one of the well-defined Chicago Community Areas. 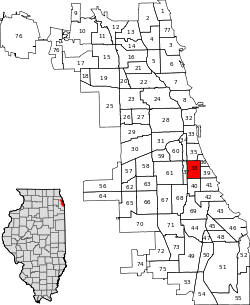 The "Great Migration" occurring in the 1940’s resulted in many entrepreneurial African Americans coming into the Chicago area and settling in the area, later to be deemed Bronzeville; occupying the area from 26th Street south until 67th Street, and from west, which is now the Dan Ryan to east to the Illinois Central railroad tracks. African American businesses flourished in Bronzeville during within the 1900’s. According to an article by Walter Williams in the September 2001 issue of Capitalism Magazine, Bronzeville boasted several hundred businesses, hosted several black newspapers, and accumulated $100 million in real-estate holdings. Bronzeville has as well been the homes of many famous figures, such as Gwendolyn Brooks, Bessie Coleman and Louis Armstong.